LibreOffice is a comprehensive personal productivity suite for Windows, Macintosh, and GNU/Linux that helps you with your document production and data processing needs. LibreOffice had 10 students for Google Summer of Code 2012, 9 of whom successfully completed their projects. Some highlights of the students’ work is below. Calc performance improvement from Daniel Bankston Daniel improved the load time of both ODF and XLSX format in many ways. In large XLSX files, the improvement can be as big as loading in a mere 6 seconds compared to the previous load time of more than 8 minutes! Enhanced Impress SVG export filter from Marco Cecchetti Marco improved his previous work to export slides in SVG by adding animations features. Thanks to his work, you will only need to have Firefox around to play your presentations anywhere. A MS Publisher import filter from Brennan Vincent Brennan’s work was particularly hard because he had to reverse-engineer the file format. Together with Valek Filipov, they managed to cover the MS Publisher format from 97 to 2010 – with all the shapes, fills, and text properties that Open Document Graphics supports. 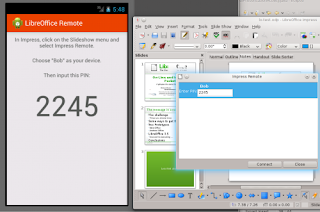 A Java GUI to pick up files for LibreOffice on Android from Iain Billett Iain’s work is particularly important for the LibreOffice Android port. He implemented a UI that allows you to pick the documents to display, move to other pages and gives you the ability to zoom in on a document. A new templates selection UI from Rafael Dominguez Rafael worked on creating a modern UI to pick a template when creating a new document. He also added support to connect to remote repositories of templates which will soon help us to connect directly to the LibreOffice templates site. Signed PDF export from Gökçen Eraslan Thanks to Gökçen, we can now digitally sign the PDFs directly as they are produced by LibreOffice. This is very important for the security and trust in electronic documents to be maintained. Android impress remote control from Andrzej Hunt Andrzej’s Android Remote Control allows you to control the slideshow directly from your Android mobile phone. Just connect your phone to the presenting computer via network or bluetooth, and you will see previews of the slides on the phone, and will be able to navigate that – instead of using the computer’s keyboard or usb remote control. Improved group session and UI for collaborative editing of files from Matúš Kukan Matúš advanced the Calc collaboration demo by adding user interface and continuing on the core work. This work, once completed, will allow you to collaboratively edit one spreadsheet with your colleague conveniently, as if you chatted with them on an instant messenger, without the need to send multiple files around. Unit tests improvements from Artur Dorda Unit tests are extremely important for LibreOffice. They are the tests that are run during the build time, and consequently are run by every developer that builds LibreOffice. Unit tests help you to make sure that the functionality hasn’t regressed over time, and if it has, to help you discover the regression quickly. Artur extended the unit tests mainly in the area of Calc. The students’ code is already in the LibreOffice master branch either as an experimental feature or it is already in use. Thanks to Google and their friendly Open Source Program team for organizing Google Summer of Code again this year and allowing us to participate.